The 2019 Mazda MX-5 Miata RF will arrive at U.S. dealerships late next month, carrying a slightly increased starting price to accommodate for its many improvements. Mazda announced on Monday that the hardtop Miata will carry a starting MSRP of $32,345 for the SKYACTIV-MT transmission-equipped MX-5 Club, up $435 from the starting price of the 2018 model. With the six-speed Sport automatic transmission with paddle shifters, the MX-5 Club starts at $32,945, also $435 more than the 2018 model. 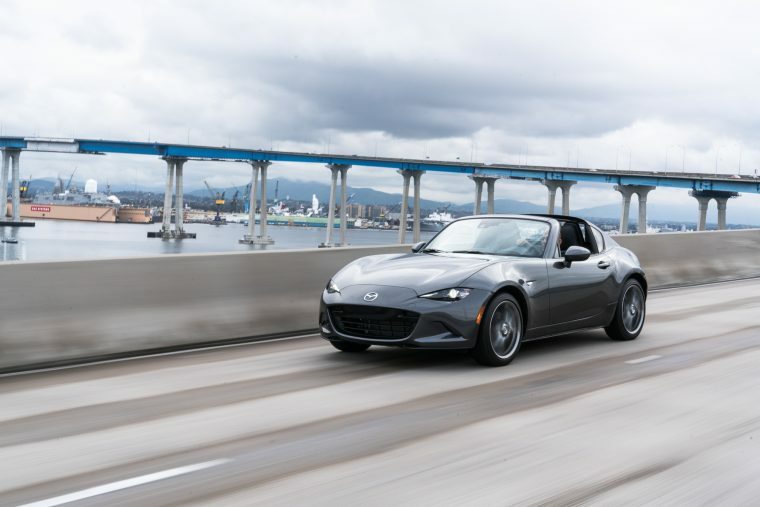 The 2019 Mazda Miata MX-5 Grand Touring starts at $33,335 for the manual and $34,410 for the automatic — both are $585 more than the outgoing model. Earlier this year, Mazda confirmed that the 2019 Miata would come equipped with a retuned SKYACTIV-G 2.0-liter engine that produces 26 horsepower and 3 lb-ft of torque more than the 2018 model. Other significant quality-of-life improvements made to the Miata include a standard tilt/telescoping steering column constructed from aluminum, a new rearview camera, and available Traffic Sign Recognition and Smart City Brake Support technologies. Also new for 2019 is a GT-S Package offered for the MX-5 Grand Touring with the SKYACTIV-MT 6-speed manual. Available for $750, this package a front shock tower brace, limited-slip rear differential, Bilstein dampers, and a hand-painted roof akin to that offered on the 2017 Mazda MX-5 RF Launch Edition. The MX-5 Grand Touring is also available with a $300 Auburn Nappa Leather package. The MX-5 Club SKYACTIV-MT is also available with a Brembo/BBS Package and Brembo/BBS/Recaro Package, priced $3,770 and $4,670, respectively. The former adds 17-inch, dark gunmetal BBS forged alloy wheels; front Brembo rotors and calipers; red-painted brake calipers for all four wheels; side sill extensions; a rear bumper skirt; and heated leather-upholstered seats. The latter swaps in Recaro bucket seats and adds a black-painted roof. The Club is also available with a $450 i-ACTIVSENSE Package that can’t be bundled with the Brembo/BBS and Brembo/BBS/Recaro Packages. Smart City Brake Support and Lane-Departure Warning the featured technologies in the package, complementing the Club’s standard Blind Spot Monitoring with Rear Cross-Traffic Alert. Mazda also revealed pricing for three colors available for the MX-5 RF: $595 for Soul Red Crystal, $300 for Machine Gray Metallic, and $200 Snowflake White Pearl Mica.